The form creation itself is just like any other RSform!Pro form, with the mention that you need to use the special Pagebreak elements. Head to Components > RSform!Pro > Manage forms, and click on the New button, located on the top-right corner. RSform!Pro allows you to add a unlimited number of fields to your form. Once in the RSform!Pro Components area, click on the field type, located on the left. Once you click on a form field type, you can specify the field name, caption, validation message and other form specific attributes. More details on this topic can be found here. This is the element that will add the separation between form pages. This will automatically add Next and Previous buttons. A nice feature is that it will automatically detect if a next or previous button is required. For example, on the first page of a form, you do not need a previous button. The same goes for the last page (you don't need a next button). Furthermore, another useful feature, is that you can validate fields that reside on a specific page when clicking the next button. An AJAX validation rule is specifically used for this, so the user will not be redirected to a different page. In the Additional Attributes area of the Pagebreak element, you can add triggers for Javacript functions (or actual code), but a return element should never be used. This can interrupt the page change or validation process. Within the Pagebreak Attributes area, you will find the newly introduced (revision 42) progress bar. This is rather useful from a user related point of view, as it will know how much of the form has been filled in. 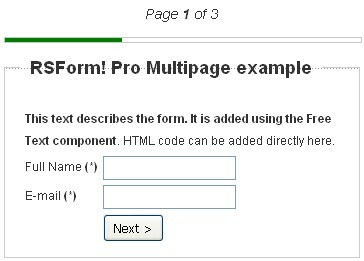 The configuration of the progress bar for the last form page is displayed within the submit button properties(Attributes tab). 14 persons found this article helpful.